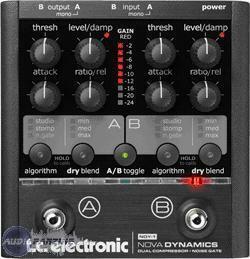 NDY-1 Nova Dynamics, Compressor/Sustainer for Guitar from TC Electronic in the Nova series. 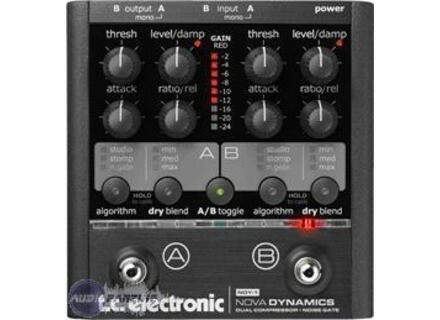 Nova Dynamics features studio and stomp compression modes as well as a noise gate combined with very flexible routing, which gives the user full dynamics control and versatility. Nova Dynamics features a unique combination of a stomp compressor providing classic pedal compression, and a studio compressor aimed at allowing totally transparent dynamics control. A noise gate and the ability to insert these effects any place in the signal chain makes the Nova Dynamics appear as an alternative to rack-based setups. The dual engine design makes it possible to switch between two different compression sounds or settings for different guitars. The dry blend feature enables the user to mix in dry signal along with the compressed signal for unaltered attack, preservation of playing dynamics and enhanced sustain. The input gain adjustment known from the Nova Delay and Reverb pedals are also included, but because of the dual engine design Nova Dynamics actually has two separate calibration engines making it possible to insert one engine in front of the amp and one in the loop. Because of the many different routing options it is supposed to fit well in either a straight serial setup or a setup with total separation of the two engines.